The health lobby has released its latest snapshot of the performance of Australia’s public hospitals, and says it points to an imminent crisis. The AMA Public Hospital Report Card 2016 shows that, against key measures, the performance of our public hospitals is virtually stagnant, and even declining in key areas. “The States and Territories are facing a public hospital funding ‘black hole’ from 2017 when growth in Federal funding slows to a trickle,” said AMA President, Professor Brian Owler. “From July 2017, the Commonwealth will strictly limit its contribution to public hospital costs. “Growth in Commonwealth funding will be restricted to indexation using the Consumer Price Index (CPI) and population growth only. “Treasury advised the Senate Economics Committee that this change will reduce Commonwealth public hospital funding by $57 billion over the period, 2017-18 to 2024-25. “As a result, hospitals will have insufficient funding to meet the increasing demand for services. “In the 2015-16 Budget, Commonwealth funding for public hospitals was reduced by $423 million for the three years to 2017-18. A further $31 million was cut in the December 2015 MYEFO Budget update. “Public hospital funding is about to become the single biggest challenge facing State and Territory finances – and the dire consequences are already starting to show. “Bed number ratios have deteriorated. “Waiting times are largely static, with only very minor improvement. 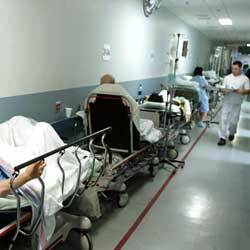 “Emergency Department (ED) waiting times have worsened. “The percentage of ED patients treated in four hours has not changed, and is well below target. “Elective surgery waiting times and treatment targets are largely unchanged. “Public hospital performance has not improved overall against the performance benchmarks set by all Governments. “On top of all that, the Commonwealth is creating additional and unnecessary demand for hospital services by reducing Medicare payments for diagnostic services in the community by $650 million. The AMA Public Hospital Report Card 2016 is available here.